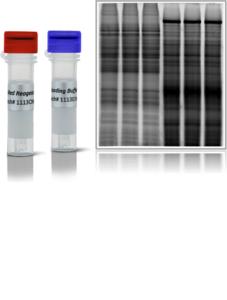 The ORCA Gel Electrophoresis unit and the corresponding VELUM Precast Gels offer the latest technique in terms of easy handling, resolution and reproducibility for up to 52 protein samples per unit and run. Proteins can be separated according to their molecular weight (SDS-PAGE), their IEF or both (SAR-PAGE). Up to 4 ORCA Gel Electrophoresis units can be combined (one on top of the other) and run simultaneously. We offer the ORCA units in two varieties. 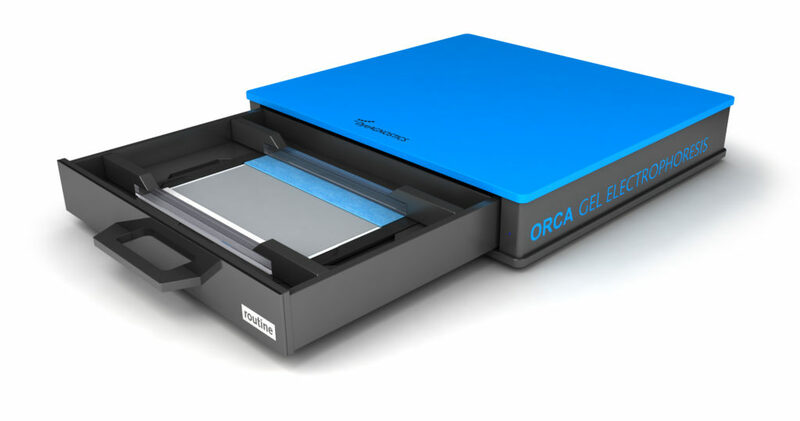 The ORCA routine is designed for error-free daily routine analysis of 1D gels (VELUM Precast 1D). 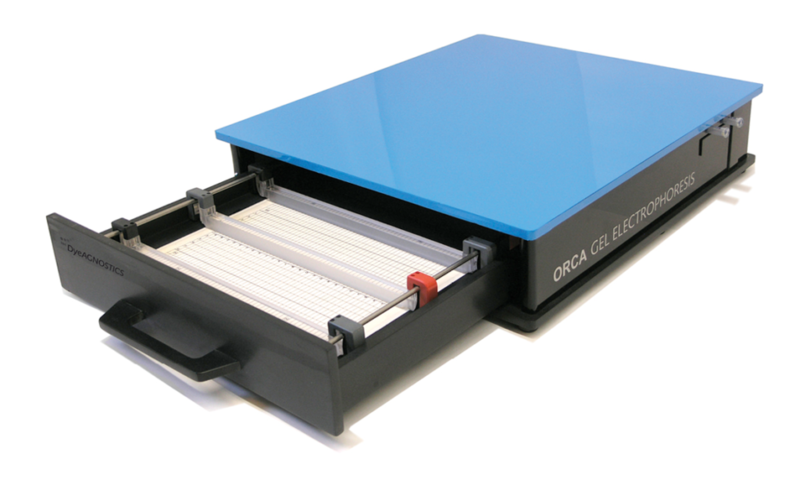 The ORCA research is designed for both, 1D gel and 2D gel electrophoresis with precast gels for horizontal electrophoresis (e.g. VELUM 1D / Velum 2D, GE EXCEL Gels). 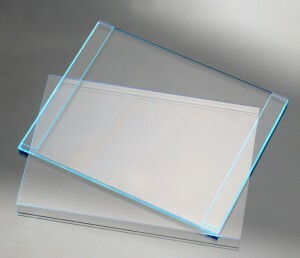 For easy blotting in HD quality we offer the VELUM Dry Blotter (1D gels) and the BEO Dry Blotter (1D + 2D gels) respectively. The ORCA routine is designed for daily protein analysis by SDS-PAGE, SAR-PAGE or IEF. The ORCA Frame Technology ensures error-free handling of the system including the correct setting of the corresponding VELUM Precast 1D Gels or the electrode. No further user education required. The ORCA research offers maximum flexibility for research & development as well as daily routine. The system is designed for horizontal 1D gel electrophoresis (using e.g. VELUM Precast 1D oder EXCEL gels form GE Healthcare) as well as horizontal 2D gel electrophoresis (using e.g. VELUM Precast 2D gels). Up to 4 modular units can be combined to one power supply (e.g. ORCA Power Supply) and cooling system (e.g. ORCA High Precision Cooler). The ORCA HP Cooler is a high precision thermoregulator. It provides constant temperatures and throughflow quantities as required for high resolution gel based protein separation. The device is suited for 1-4 ORCA Gel Electrophoresis units. Its compact design does not require much lab space and we also like its robustness. Robust programme-controlled Power Supply for 1-4 ORCA Gel Electrophoresis units. Suited for all gel-based protein separations including high voltage applications (up to 3,000 V) such as IEF and 2DE. 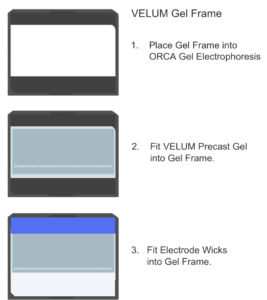 The VELUM Gel Frame ensures for the error-free positioning of the VELUM Precast 1D Gels and the corresponding electrode wicks into ORCA Gel Electrophoresis. Detect proteins within seconds without any staining. 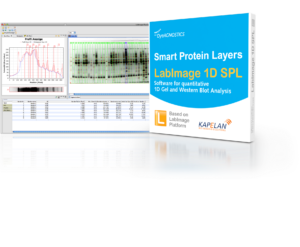 Our SPL protein labeling technology provides digital images for quantitative and qualitative protein analysis. As the SPL technology is based on a combiantion of fluorescent labels and bi-fluorescent standards, we customize the system according to your needs (e.g. automatic quantification of certain proteins, automated Rf value determination independent on electrophoresis, standardized analysis. The SPL software automatically analyzes the image by preprogrammed prarmeters (e.g. identification and quantification of single proteins). 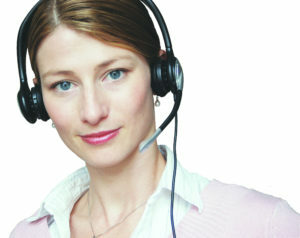 The analysis is provides as customized report. All data can be integrated in the computer network. 21 CFR Part 11 compliant. We are happy to provide further information. or by email info dyeagnostics.com. The DOLPHIN is a simplified form of the ORCA as it cannot be stapled. However its performance egal the state of the art ORCA systems. 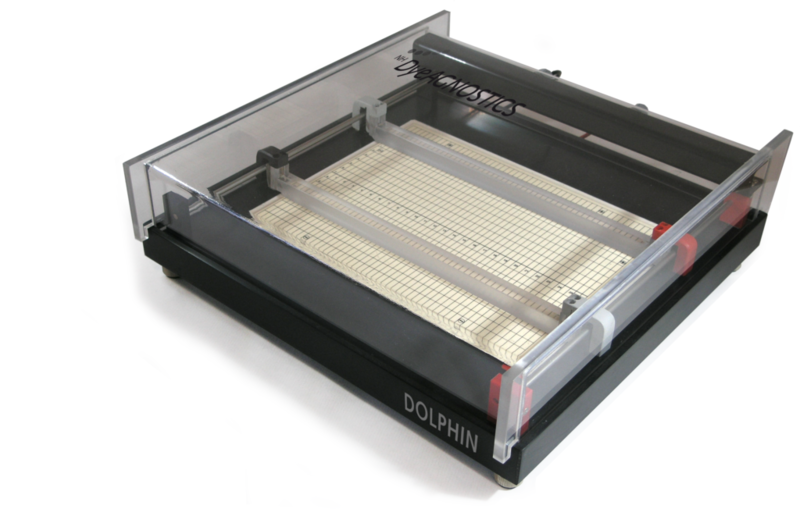 The DOLPHIN is the ideal replacement of GE Healthcare Life Sciences discontinued Multiphor ll Electrophoresis System only more handy and safer. All types of film-backend gels recommended for horizontal gel electrophoresis are suitable (e.g. VELUM 1D / Velum 2D, GE EXCEL Gels). The VELUM Gel Frame ensures for the error-free positioning of the VELUM Precast 1D Gels and the corresponding electrode wicks onto the DOLPHIN Gel Electrophoresis.